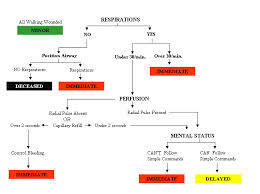 Principle purpose of this lecture is to present Casualty Triage situation. Triage is the process of finding out the priority of patients’ treatments while using severity of their condition. This rations sufferer treatment efficiently any time resources are insufficient for everyone to be treated immediately. Large casualty situations occur when the amount of casualties exceeds your available medical power to rapidly treat along with evacuate them. The actual numbers varies depending on available resources and can be a soldier medic being forced to manage more than one casualty at a time. This lecture briefly describe familiarity with the principles of casualty triage, perform casualty triage in a given situation and understand patient triage vs. evacuation categories.